A “good afternoon” greeting rings out in unison from the 40-strong class of Cambodian kids gathered in a makeshift school room at a home stay near Angkor Wat, Siem Reap. These children have a benefactor who set up this school at his own expense eight months ago to teach the region’s youngsters to speak English. Homestay offers something for everyone: team building, camping, weddings, functions, cooking classes, fishing (in the purpose-built fish farms) rice harvesting and ox cart rides and the very important student programs. Catering and lunches are a core part of the business with more than 9500 catering and lunch guests last year usually as they return from viewing Angkor Wat and surrounding temples. A seven-course lunch using local produce ranges from USD$12 to $20. Also available are sunrise breakfasts, cocktail sunsets and special events that take advantage of the 3.6 hectare site opposite the Butterfly Gardens. The Bong Thom Homestay is a unique community-based tourism site which captures the essence of village life in the heartland of Cambodia. Located in San Day Village, Banteay Srey District, Siem Reap Province, on the way to Bantey Srey temple about 26Km from Siem Reap, The Bong Thom Homestay is ideally situated with easy access to the popular tourist destination of Siem Reap, home of the world-famous Angkor temples: 18km from Angkor Wat, 10km from Prasat Pre Rup, 9km from Prasat Banteay Sam Rea, 19km from the Kbal Spean waterfall, 25km from the Phnom Kulen waterfall. 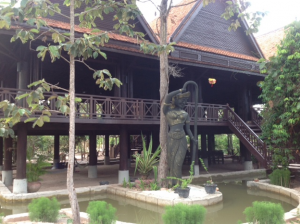 Guests can relax while immersing themselves in the vibrant culture of Cambodia. All the rooms are designed with comfort in mind, all built of teak and local timbers and standing on stilts. A full range of popular amenities and a friendly, caring staff are a high point which guarantees a wealth of repeat business. The Bong Thom Homestay was founded by Mr Sou Say (Thom) in response to growing demand from European and other tour operators. Apart from the activities they required the development and introduction of genuine Khmer foods of the district. The first phase of the project opened to international guests in 2009. As a community-based project with neighboring Phum Sanday, the Bong Thom Homestay aims to help diversify livelihoods and reduce poverty in the countryside. 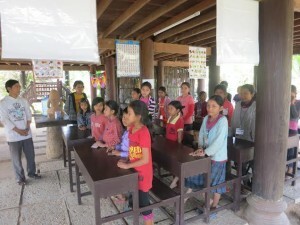 The Bong Thom Homestay employs 20 local villagers on a full-time basis and can call on extra staff to service larger groups. The objective is to liaise with local communities and use their own resources, and to provide opportunities for visitors to experience the culture, local nature and true Khmer lifestyle. Mr Thom, as well as being the school benefactor and an insightful pillar of the local community, is also a general manager of an international hotel in Siem Reap.